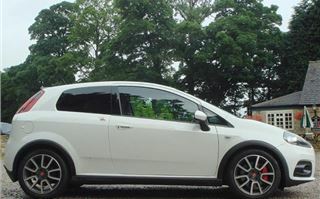 The Grande Punto Abarth is not merely a glorious name tacked onto a competent hatchback. 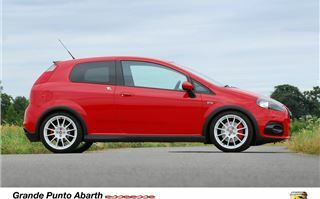 In the days when small FIATs had their engines in the back, Carlo Abarth was the guy who put the stings in their tails. Hence the scorpion badge. His special parts used to arrive at the tuning shop in a wooden crate. And the spannermen would get to work turning a humble FIAT 600 into an Abarth 750TC, then 850TC and eventually 1000TC developing as much as 108bhp. Abarth went on to build beautiful little rear-engined Zagato bodied coupes with FIAT or Simca based engines, some of which were finished off by Radbourne Racing in London. And he graduated to bigger and better ventures including sportscar racing, taking on the likes of Porsche and Ferrari with considerable success. The FIAT brand reflected in this glory so it was only natural that FIAT should want to revive the notoriety of the Abarth name. 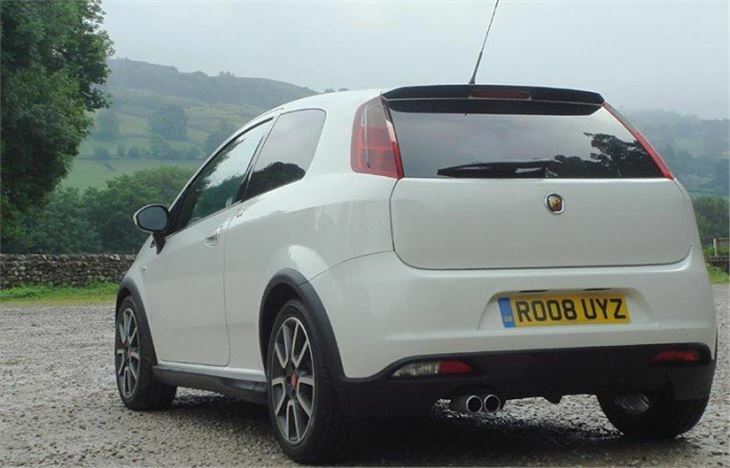 As well as sticking scorpion badges all over the Grande Punto, it has done a proper job that Carlo would have approved of. Under the bonnet you get a mildly tweaked FIAT 1.4 T-Jet engine, mustering 155PS instead of its normal 150, with a ‘sport’ overboost button that summons an extra 17lb ft of torque, bringing the max to 169lb ft. (a MINI Cooper has 118lb ft and a MINI Cooper S 192lb ft on overboost). This hauls it to 60 in a lively 7.9 seconds and on to 129mph at no huge sacrifice in economy and CO2. It’s geared at 25mph per 1,000rpm in 6th, manages over 40mpg combined and emits just 162g/km CO2 (Cooper S 164g/km). That’s £145 tax this year and £175 next year, if the 2008 budget proposals aren’t changed. It sits on 215/45 R17 P Zero Nero tyres and quite stiff springs so ride is hard over dilapidated urban streets, but it has excellent damping so out on real roads the chassis comes together with very good undulation absorption and a nice, grippy front end. This gets even better with the Sport button pressed because not only does the engine give more torque, the electric steering weights up and gives you all the feedback you want. It’s actually better than a MINI Cooper S. You can hool across moors with a grin from ear to ear, then, when you get to a motorway, switch ‘Sport’ off and cruise in as much refinement as an R56 Cooper S.
Inside, as well as a very nice steering wheel and neatly-finished dash, you get superbly supportive part-leather bucket seats. I hope VW and BMW buy an Abarth Grande Punto to learn how to make sports seats that don’t turn an average size driver into a hunchback. And, something I hadn’t noticed before, when you open the driver or passenger’s window of a 3 door Punto on the move, you don’t get buffeted. 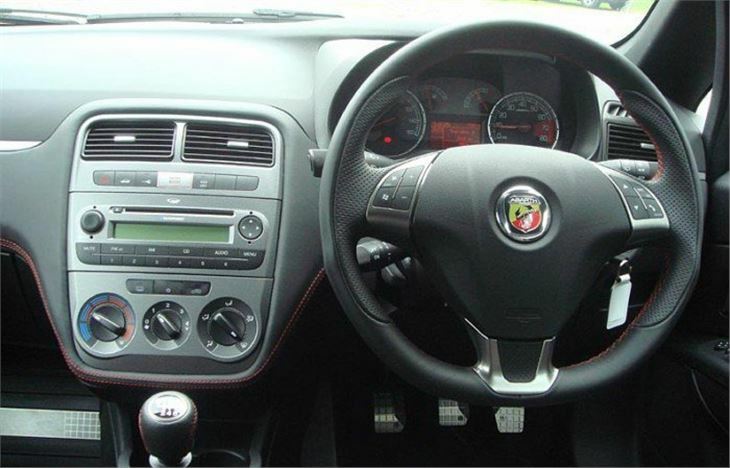 The Alfa 147 had that feature too, so you could hear the delightful rasp of its engine if you wanted. 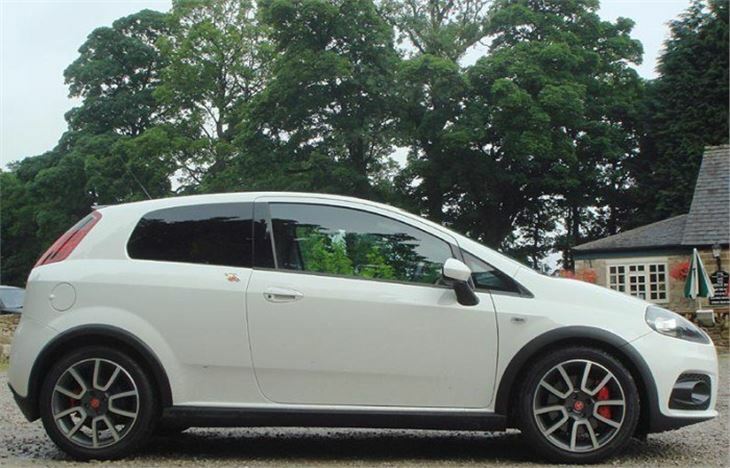 The Abarth Grande Punto described so far is what you get for £13,500, which is actually less than the much slower MINI Cooper with the same level of equipment. If you want to go mad you can spend an extra £3,500 on the full Esseesse kit. Like Abarth bits of the past, this arrives your Abarth dealer in wooden crates as is retrofitted to the car. You can spend less and buy the ‘Asetto’ suspension kit alone, but if you want the engine kit you have to have the suspension kit to keep you on the road. This consists of lowered springs, cross-drilled front brake discs, softer brake pads and 18” alloy wheels with 215/40 R18 P Zero Nero tyres. The underbonnet box of goodies includes a Garrett 1446 turbocharger with boost increased from the standard car’s 1.3 to 1.5 bar, a different injector rail, new water cooling and oil pipes to the turbo, new exhaust manifold, heat shield, MPA sensor, boost sensor, modified cat converter, larger diameter exhaust, new intercooler pipework, adapted radiator pip, new waterpump, new wastegate valve and new software for the ECU. That little lot boosts maximum power to 180bhp and torque to 200 lb ft, pulls the 0-60 down to 7.2 seconds and lifts the top speed to 133mph. We didn’t try it on the road, but up Harewood hillclimb it was much more eager than the standard car, though it took more skill than I had to keep the engine off the ESP (which can’t be switched off). On the road, though, with members of the public coming in the opposite direction, our experience of the standard car, suggests this will not be a problem. The ESP simply doesn’t intrude unless it needs to. 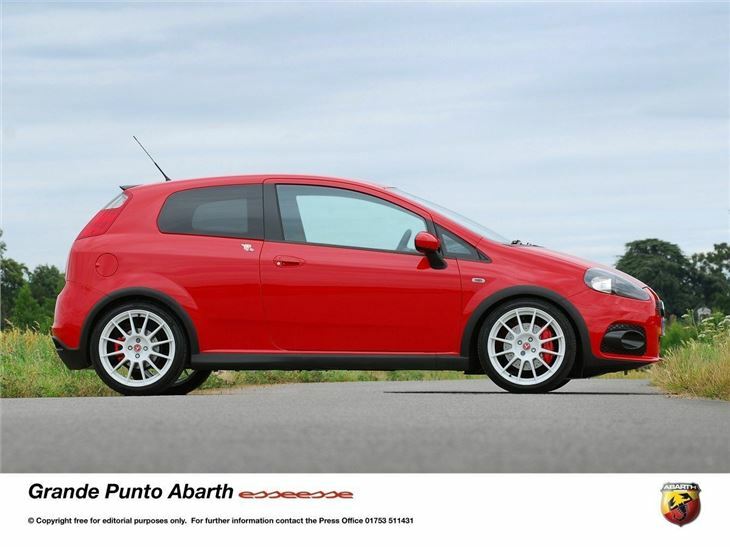 Of course, the Grande Punto isn’t going to be the only new Abarth. 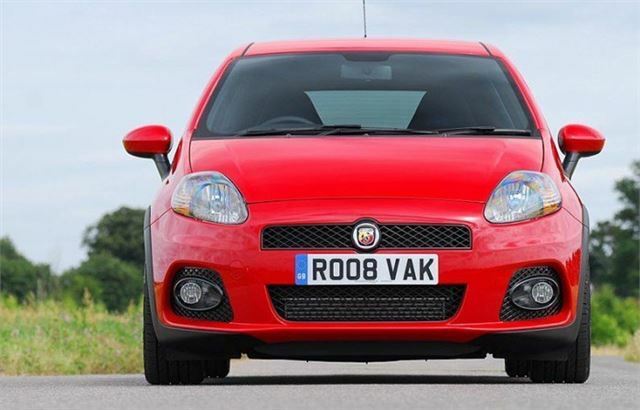 The same magic wand has been waved over the FIAT 500, likely to reach UK showrooms in the autumn. With its shorter and basically less stable chassis, the wick has had to be turned down a bit to 135bhp and a maximum of 152 lb torque in Sport mode. 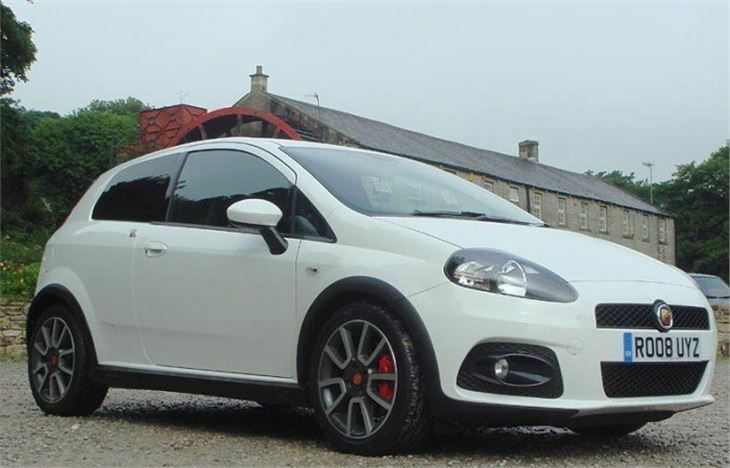 Though with the same Torque Transfer Control as the Grande Punto Abarth gets its power down better than a standard 500 1.4, and at 7.6 seconds its 0-60 is 0.3 of a second quicker than the Grande Punto Abarth. Like the old Abarth 850 and 1000TC there have been considerable body mods, with a front bulge to accommodate the turbo, ‘nostrils’ either side to feed the twin intercoolers, a bigger front air intake, a large roof spoiler and a rear fin-shaped valence diffuser. Inside a new instrument panel with turbo boost gauge, flat bottomed leather steering wheel, special seats and black roof lining complete the sporty feel. While 155g/km CO2 keeps tax down to £150 next year. European market 500 Abarths will be launched with an Esseesse kit lifting the power to 160PS, and this will eventually be a £3,500 option on standard cars. With the Sport button activating stiffer steering and an anti roll bar fitted inside the rear suspension twist beam, handling is said to be vastly better than the FIAT 500’s. 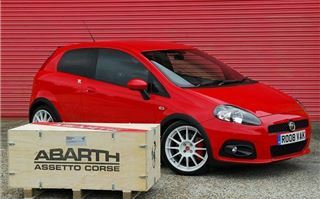 Abarth has put back a bit more than brio into the new small FIATs. They are genuine small high performance cars, safe to use on the road. Not as hooligan as a MINI Cooper S John Cooper Works with everything turned off. But nothing like as expensive either. Fun cars for sensible money. And just what FIAT needed to continue brightening up the brand.